This volume of over 135 inventive salad recipes is timed to answer the great demand for healthy recipes with organic ingredients. Walthers offers up delicious twists on tired classics, including pasta salads, salad wraps, bean salads, whole grain salads, and chicken salads. Helpful hints on preparation and health benefits appear throughout. 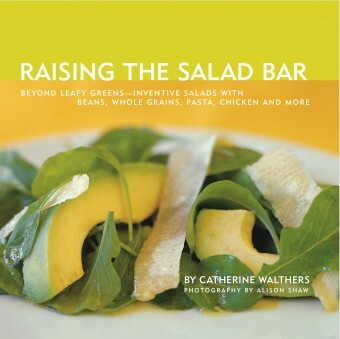 “RAISING THE SALAD BAR is one of the best cookbooks I have ever sampled. I prepared dozens of the salads, and each is more scrumptious than the next. The Wheat Berry Salad with Citrus Dressing was my favorite until my husband prepared the Baby Spinach and Strawberry Salad and the Seared Scallop Salad with Watercress and Pineapple for my birthday and both were dazzlers. “I had pretty much sworn off of buying new cookbooks because there are so many great internet sources for recipes. I still don’t know what came over me the day that I bought it but I am so glad I did! I have since made many of these salads for myself and gatherings and each has been a huge hit. The ingredients are easy to find and preparation is simple enough to do at the last minute. Seriously, I have never been a dressing whipper-upper before but I haven’t served a store bought dressing in the year that I’ve owned this book! My everyday dressing is the Maple Balsamic Vinaigrette.